The County FA has said expletive-filled abuse sent from a social media account, claiming to be that of a match referee, to Melton Town fans was not published by the official. The organisation has launched an investigation after several Town supporters received foul-mouthed replies from a Twitter account purporting to be from match referee Dave Bullen who took charge of Town’s 2-1 defeat to Lutterworth on Saturday. The incident was reported to the Leicestershire and Rutland FA who believe the account, which began operating in February, to be fake. A spokesman said: “We are aware of the Twitter comments made by the account over the weekend. “We do not believe the account to be run by the referee in question. “We are currently working with him to identify who is running the account. Fans were unhappy after Leon Fray and Sam Wilson were both sent off in separate incidents in the opening 10 minutes of the top-of-the-table clash in United Counties League Division One. 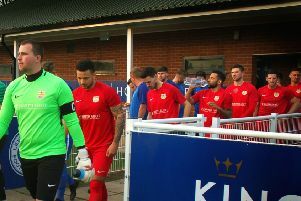 A member of Melton’s dugout was also dismissed in the aftermath of the second red card, before Josh Hill saw red midway through the second half for disputing the penalty which brought the visitors level. Despite being reduced to eight men, Town were only beaten by a late Lutterworth winner. Co-manager Tom Manship, who played the full 90 minutes, did not wish to comment on the officials’ performance, or its aftermath, while the investigation was ongoing. The United Counties League, who are responsible for appointing match officials, said they had forwarded all comments on social media to the Leicestershire FA, and also could not comment further. It escalated when another supporter got involved, with several expletives exchanged between the two. The following day the account described Melton Town, who, like the County FA had blocked the account, as sore losers and boasted that the account had gained new followers overnight. The account - which also predicted Melton would win the match in a post on Thursday – had yet to be deleted at the time of going to press.